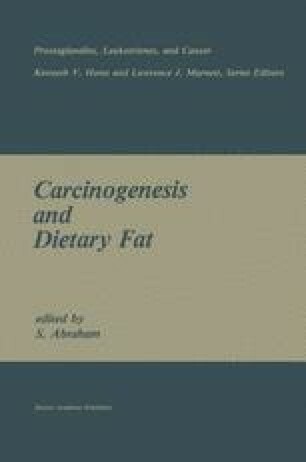 For well over forty years it has been known that spontantaneous, as well as carcinogen-induced mammary tumor development in experimental animals was potentiated by dietary fat (1). Likewise, epidemiological analyses over a nearly equally long time period (2) have indicated that the quality and/or quantity of dietary fat affected breast tumor incidence in man. A great number of plausible mechanisms for this relationship have been suggested, including dietary fat effects on hormone levels (3), actions of certain lipids as tumor promoters (4), prostaglandin substrates (5,6), membrane fluidity altering agents (7), sensitizers of cells to growth factors (8), cell-cell communication modulating substances (9), et c. Suffice it to say that the mechanism whereby dietary fat influences breast tumor incidence in man or mouse remains to be explained.